I work for an HVAC company that installs HVAC equipment in distribution centers and other industrial buildings all over the state. We use a boom crane to lift commercial air conditioners to the roof to install them. Once they’re on the roof, it takes several workers to re-position them with a handcart. It’s a difficult, dangerous, and time-consuming process. When we have to repair something, reaching into the system to lift heavy parts like the compressor can also be difficult. Some of the commercial compressors we service and replace can weigh as much as 1500 pounds. I’d like to suggest that we invest in a few portable crane systems, which would help us to position A/C systems once they’re lifted to the roof. We could also, potentially, use these systems for maintenance and repair. Please let me know if you have any recommendations. We manufacture lots of overhead cranes, so we believe that purchasing the right material handling solution can be extremely beneficial for any industry. Heavy lifting can be dangerous and time-consuming; in fact, according to OSHA and TMC Safety Manager Tony Barsotti, heavy lifting is one of the top three common workplace hazards for workers in the HVAC industry. For any HVAC company—residential or industrial—it’s important that workers are lifting and transporting heavy systems and components safely and effectively. All injuries are preventable and with such a vast array of potential hazards for HVAC employees, it’s a little frustrating to learn that so many work-related injuries are musculoskeletal disorders caused by lifting heavy equipment. To reduce hazardous work-related exposures, HVAC companies should be looking to incorporate methods or equipment to help reduce their employee’s physical workload. For motivation, consider the consequences of a poor working environment. These consequences commonly include absences due to injury, overtime for replacement workers, high employee turnover, increased training and supervisory time, reduced productivity, and poor quality of work. One way to avoid these problems is to consider material-handling solutions specifically developed for portability, durability, and versatility. Many HVAC companies use a supplemental lift system to streamline the process of moving and positioning heavy A/C systems quickly and easily. For that type of application, an aluminum gantry crane is a perfect solution. 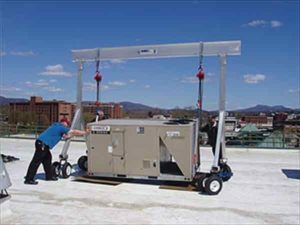 Aluminum gantry cranes are lightweight, portable, and extremely stable under load, making them a popular material handling solution among HVAC companies, contractors, and maintenance applications. These systems are designed for mobility; one worker can assemble and dissemble a 3-ton aluminum gantry crane in less than three minutes. For HVAC companies who travel from one job site to another, the aluminum gantry crane is an essential piece of lift equipment that improves productivity, safety, and efficiency. A central A/C unit is heavy enough to require a crane to lift it up to a roof or other mechanical aid to place it next to a house. These units are not something several men can pick up and move around easily. But, with the help of an aluminum gantry crane, workers can lift up to 3 tons quickly and safely, and move them wherever they need to go. Pneumatic tires ensure easy transport under load, and are perfect for soft roofs. Just one or two workers can move the disassembled crane up stairways, onto roofs, or in other challenging locations. Once on location, the gantry crane is easily assembled, ready to lift, and able to precisely position heavy objects, such as bulky HVAC units. Aluminum gantry cranes are also ideal for workers who maintain and repair HVAC units. Considering that most compressors can weigh anywhere from 250 to 1500 pounds, allowing workers to lift these components is risky and inefficient. Aluminum Gantry Cranes are extremely precise, adjustable for tight spaces, and tough enough to lift and transport very heavy loads. Because they are corrosion resistant, aluminum gantries are also ideal for refrigerated areas, clean rooms, and other controlled environments. These systems fit easily on service trucks, making them the perfect supplemental lift system to transport from one job site to another. Incorporating an aluminum gantry crane into your installation/maintenance routine is a highly efficient, cost-effective way to improve worker safety, increase productivity, and save time and valuable resources. For our friends in the HVAC industry, there’s really no reason not to use one.